Clinical neurologic evaluation of our patients in the NICU is limited; a careful detailed neurologic exam can only reveal so much in newborns who can’t cooperate or communicate. Many of our patients need ancillary testing to reveal what is going on in their brains. Infants who are at risk of seizures are very often undertreated, with few of their actual seizures being diagnosed, or overtreated with many of their clinically diagnosed seizures not actually being seizures at all. For example a study from Cork from 2008 (Murray DM, et al. Defining the gap between electrographic seizure burden, clinical expression and staff recognition of neonatal seizures. Arch Dis Child Fetal Neonatal Ed. 2008;93(3):F187-91.) enrolled 51 near term infants who were at risk of seizures, and recorded their EEGs. Nine of them had electrographic seizures, and 3 others were clinically thought to have seizures but there was nothing on the EEG. The 9 babies with seizures had a total of 526 electrographic seizures, with only a third of those EEG seizures having convulsions visible on the video. One of the babies had 56 seizures, 48 of which had movements on the video, but none were detected clinically. In a total out of over 500 seizures, less than 50 of them were identified and noted in the medical record. On the other hand, three quarters of the seizures recorded in the medical notes were not accompanied by any EEG changes. In that study, although the EEG was not masked, the staff did not usually use the EEG to identify or treat seizures. A new multicenter study (Rennie JM, et al. 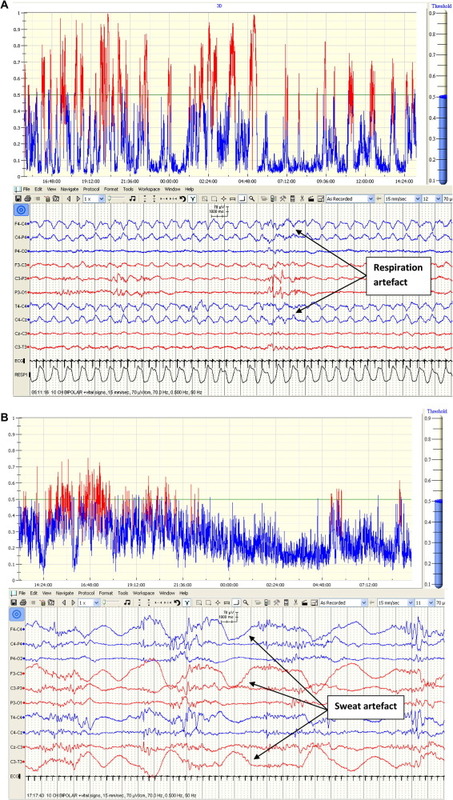 Characterisation of neonatal seizures and their treatment using continuous EEG monitoring: a multicentre experience. Archives of disease in childhood Fetal and neonatal edition. 2018) has some features in common with that publication, in both the methods and its results. 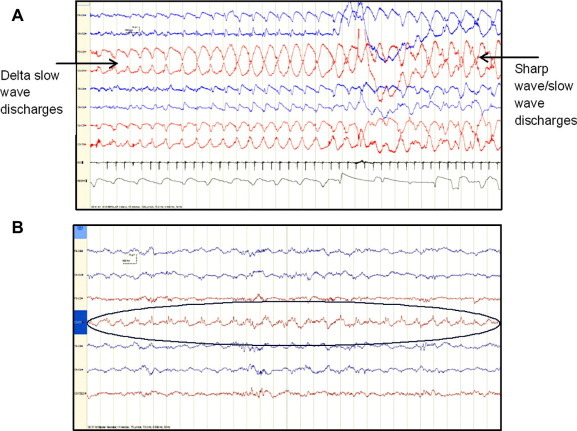 The 6 centers involved all had equipment to record a complete EEG, and display an aEEG; both clinical evaluation and aEEG interpretation were used to diagnose seizures, some centers would look at the regular EEG to make decisions, but none had an on-call system for immediate expert EEG interpretation; many would have been assisted intermittently by a neurologist/neurophysiologist. This seems to reflect what has become a standard practice in advanced NICUs, including our own. 214 babies with evaluable EEG were enrolled who were more than 36 weeks gestation and at risk of seizures, because of suspected stroke, asphyxia, meningitis or abnormal movements. The EEG was started on the first day of life and continued for at least 24 hours. 75 of the babies had seizures on their EEG. Some babies were having seizures when the EEG was started, and they tended to be babies where the monitoring started later. A bit more than half of the babies were in the study because of HIE, and about half of the moderate and severe HIE had seizures on EEG, quite a few of them had already received anticonvulsants before starting the EEG, but had seizures nevertheless. The other two groups who had many seizures were babies with stroke (55% had seizures), and with metabolic or genetic disorders (80% had seizures). The babies had loads of seizures,with a peak seizure burden among all categories combined a median of 20 minutes per hour (IQR 11 to 32 min), and not a lot of difference in seizure burden between categories. Severe HIE had more seizures than moderate HIE and they continued for longer, but usually stopped by 96 hours. 27 babies who had no seizures received anticonvulsants (a quarter of them getting more than 1 drug), and 20% of the babies who did have seizures never received an anticonvulsant. Of those with seizures who received an anticonvulsant, almost all got phenobarbital, and 60% then received a second drug, with a quarter receiving 3 or more drugs. The second line drugs were most commonly midazolam and phenytoin (which surprised me a bit, we have stopped using phenytoin, and even in 2013-2105 use was rare). Time to treatment of confirmed seizures is sometimes very delayed, taking a median of 2 hours (IQR 0.8 to 4.2 h) after the first recorded seizure. should be reviewed in neonates at risk of seizures. I think they are right, even in 6 European centers with enough interest in the subject to be part of this study, detection and treatment of seizures was very suboptimal. I think in centers that are less committed to EEG monitoring the results would be worse. And some of the artefacts that can look like seizures. When we have a system that works well, we can maybe figure out which anticonvulsants actually work, and which work the best.The data from these recent studies show that phenobarbital is not very effective, about 95% of the babies get phenobarb as the first line therapy, but then 2/3 go on to receive a second treatment. That is consistent with the study from Bob Hall of the use of prophylactic phenobarb in asphyxiated babies, a dose of 40 mg/kg of phenobarb compared to placebo led to only a small decrease in the proportion of babies who went on to have clinically diagnosed seizures: 9/15 treated compared to 14/16 controls. (Hall RT et al. High-dose phenobarbital therapy in term newborn infants with severe perinatal asphyxia: a randomized, prospective study with three-year follow-up. J Pediatr. 1998;132(2):345-8) Remember, however, that their long term outcome was improved with phenobarbital, despite modest anti-seizure effect. There is currently little hard proof that seizures in the neonatal period lead to worse outcomes, all other things taken into account. I am, however, fairly convinced that it is indeed true that they do, based on animal data and observational studies, and am happy to treat a baby with known seizures. I would love to be able to treat a baby with an effective medication when they have seizures, and not to treat those that don’t. These new data confirm that I sometimes probably treat babies without seizures, and, on the other hand, don’t intervene when I should, and certainly not as quickly as I should. 1 Response to Who needs an EEG? Very interesting. Does anyone have expirence with the seizuredetection software provided with the Olympic Brainiz Monitor from Natus. I don’t think they as of yet can provide clinical data that shows improved outcome, but how accurately does it recognize seizures and does it assist effectively in clinical decision making regarding treatment vs no treatment.